Scattered Thoughts On Books. 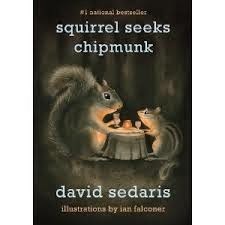 : Squirrel Seeks Chipmunk - David Sedaris. This was part of my 2014 reading Challenge on Goodreads.com. I first got to know David Sedaris through his Radio 4 series "Meet David Sedaris" and thoroughly enjoyed his monologues on his everyday life, so I had high expectations for this book which unfortunately did not come fully to fruition with Squirrel seeks Chipmunk. The premise is interesting however the execution is just slightly off and means that the book frequently doesn't hit the heights we have come to expect from his essays. It is a series of short stories about everyday life however instead of human interaction it is based around animals. From a studding dog philosophising on adultery, Lab animals discussing whether illness is psychosomatic and Storks trying to explain to their offspring where they came from, the humour is there but it is the setting that often lets it down. I wish I could be more positive about the book as I liked is earlier works and his works since this has been published but it falls flat more often than not. I think in my humble opinion is that a lot of his material is funny because we can relate to them, however, because they stories have been superimposed onto unlikely pairings of animals I found them stilted and often fragmented. A shame as it could have been so much more.